Dhanush and Sivakarthikeyan to clash on Ramzan day! 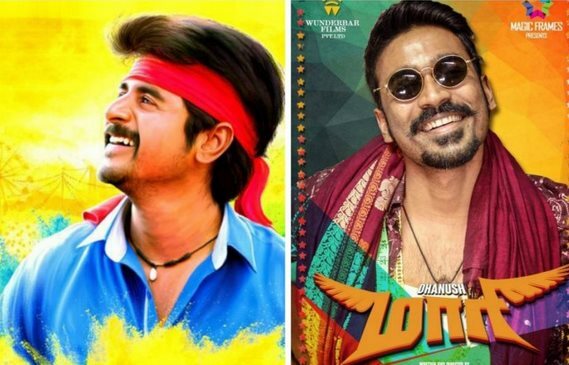 Dhanush starrer Maari and Sivakarthikeyan’s Rajini Murugan will have a head to head clash at the box office on July 17 th . Home » Dhanush | Maari | Rajini Murugan | Release Date | Siva Karthikeyan | » Dhanush and Sivakarthikeyan to clash on Ramzan day! Dhanush starrer Maari and Sivakarthikeyan’s Rajini Murugan will have a head to head clash at the box office on July 17th. The makers of Rajini Murugan had announced quite some weeks ago that the film will be a Ramzan release and now Maari has joined the fray. With the Ramzan weekend being long, it is natural that the filmmakers want to cash in on it. Yet another announcement from the Maari team is that the film’s audio launch will happen on May 25th. The most discussed topic in gossip columns for the past few months is undoubtedly the relationship between Sivakarthikeyan and Dhanush in the industry. While both of them have repeatedly brushed off rumors and maintained that there’s no issue between the two, media relentlessly kept writing about the tiff between them. The recent announcement release date of their respective film adds more fuel to the fire. ‘Maari’ directed by Balaji Mohan has Kajal Agarwal as Dhanush’s heroine and is said to be an out and out commercial fare while ‘Rajini Murugan’ has Sivakarthikeyan, Keerthi Suresh and Soori and is directed by Ponram who gave the super hit ‘Varuthapadatha Valibar Sangam’. Trade sources suggest that Studio Green is keener to release Baahubali on July 17th if the post production gets completed on time. However, sources say there are high chances for Rajini Murugan to get postponed. Will Dhanush and Sivakarthikeyan, who maintain that they share a sibling-like relationship, lock horns at the box office?